On this day we celebrate two Apostles Saint Simon and Saint Jude Thaddeus, most probably because some historians have them being martyred together. The name of Simon occurs in all the passages of the Gospel and Acts, in which a list of the Apostles is given. To distinguish him from St. Peter he is called (Matthew 10:4; Mark 3:18) Kananaios, or Kananites, and Zelotes (Luke 6:15; Acts 1:13). Both surnames have the same signification and are a translation of the Hebrew qana (the Zealous). The name does not signify that he belonged to the party of Zealots, but that he had zeal for the Jewish law, which he practised before his call. St. Jerome and others wrongly assumed that Kana was his native place; were this so, he should have been called Kanaios. The Greeks, Copts, and Ethiopians identify him with Nathanael of Cana; the first-mentioned also identify him with the bridegroom of the marriage of Cana, while in the “Chronicon paschale” and elsewhere he is identified with Simon Clopas. The Abyssinians accordingly relate that he suffered crucifixion as the Bishop of Jerusalem, after he had preached the Gospel in Samaria. Where he actually preached the Gospel is uncertain. Almost all the lands of the then known world, even as far as Britain, have been mentioned; according to the Greeks, he preached on the Black Sea, in Egypt, Northern Africa, and Britain, while, according to the Latin “Passio Simonis et Judae” — the author of which was (Lipsius maintains) sufficiently familiar with the history of the Parthian Empire in the first century — Simon laboured in Persia, and was there martyred at Suanir. However, Suanir is probably to be sought in Colchis. According to Moses of Chorene, Simon met his death in Weriosphora in Iberia; according to the Georgians, he preached in Colchis. His place of burial is unknown. Concerning his relics our information is as uncertain as concerning his preaching. From Babylon to Rome and Toulouse we find traces of them; at Rome they are venerated under the Altar of the Crucifixion in the Vatican. His usual attribute is the saw, since his body was said to have been sawed to pieces, and more rarely the lance. He is regarded as the patron of tanners. In the Western Church he is venerated together with St. Jude on October 28 while the Greeks and Copts observe the feast on May 10. Ancient writers tell us that he preached the Gospel in Judea, Samaria, Idumaea, Syria, Mesopotamia, and Lybia. According to Eusebius, he returned to Jerusalem in the year 62, and assisted at the election of his brother, St. Simeon, as Bishop of Jerusalem. He is the author of an epistle (letter) to the Churches of the East, particularly the Jewish converts, directed against the heresies of the Simonians, Nicolaites, and Gnostics. This Apostle is said to have suffered martyrdom in Armenia, which was then subject to Persia. The final conversion of the Armenian nation to Christianity did not take place until the third century of our era. Jude was the one who asked Jesus at the Last Supper why He chose to reveal Himself only to the disciples and not the world. Jesus said “If anyone loves Me, he will keep My word, and My Father will love him, and We will come to him and make Our home with him” (John 14:22). Little else is known of his life. Legend claims that he visited Beirut and Edessa. Western tradition says that after preaching in Egypt, Simon joined Jude, and they went on missions for time in Persia. From the Sixth century legends say Simon and Jude were martyred together in Persia at Sufian (Siani). Jude is invoked in desperate situations because his New Testament letter stresses that the faithful should persevere in the environment of harsh, difficult circumstances, just as their forefathers had done before them. Therefore, he is the patron saint of desperate cases. To me Thy friends, O God, are made exceedingly honorable : their principality is exceedingly strengthened. (Psalm 138: 1-2). Lord, Thou hast proved me, and known me; Thou hast known my sitting down and y rising up.v. Glory be to the Father and to the Son and to the Holy Ghost, as it was in the beginning, is now and ever shall be, world without end. Amen. 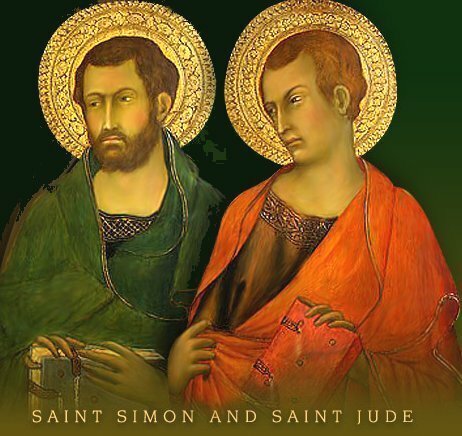 God, Who hast granted us to come to the knowledge of Thy name through Thy blessed apostles Simon and Jude, grant us to celebrate their everlasting glory by advancing in knowledge and to improve by this celebration. Through Jesus Christ, thy Son our Lord, Who liveth and reigneth with thee, in the unity of the Holy Ghost, ever one God, world without end. R. Amen. Brethren: To each one of us grace was given according to the measure of Christ’s bestowal. Thus it says, Ascending on high, He led away captives: He gave gifts to men. Now this, He ascended, what does it mean but that He also first ascended into the lower parts of the earth? He Who descended, He it is Who ascended also above all the heavens, that He might fill all things. And He Himself gave some men as apostles, and some as prophets, others again as evangelists, and others as pastors and teachers, in order to perfect the saints for a work of ministry, for building up the body of Christ, until we all attain to the unity of the faith and of the deep knowledge of the Son of God, to perfect manhood, to the mature measure of the fullness of Christ. You shall make them princes through all the land; they shall remember Your name, O Lord. V. The place of your father your sons shall have; therefore shall nations praise You. Alleluia, alleluia. Ps 138:17 V. Your friends, O God, are made exceedingly honorable; their principality is exceedingly strengthened. Alleluia. Through all the earth their voice resounds, and to the ends of the world, their message. We honor, O Lord, the everlasting glory of Your holy Apostles Simon and Jude; we beseech You, that, purified by this sacramental rite, we may the more worthily celebrate their glory. Through Jesus Christ, thy Son our Lord, Who liveth and reigneth with thee, in the unity of the Holy Ghost, ever one God, world without end. R. Amen. You who have followed Me shall sit on thrones, judging the twelve tribes of Israel. Having received Your sacrament, we humbly beseech You, O Lord, that, by the intercession of Your blessed Apostles Simon and Jude, the rite we perform in honor of their passion may profit us as a healing remedy. Through Jesus Christ, thy Son our Lord, Who liveth and reigneth with thee, in the unity of the Holy Ghost, ever one God, world without end. R. Amen.